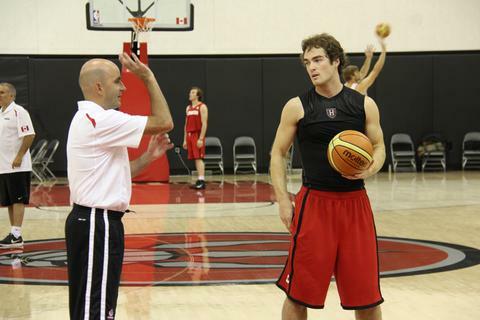 The NBA’s Phoenix Suns hired Dave as a Shooting Consultant for the 2009-10 season. Dave worked exclusively with Louis Amundson, and the impact was immediately recognizable. Louis’s free throw percentage improved by 11% over the previous season, and he also achieved career highs in field goal and free throw percentage. In 2013 Coach Love was hired by the Cleveland Cavaliers to work with fellow Canadian Tristan Thompson. Thompson became the first player in NBA history to switch his dominant shooting hand, and under Coach Love’s guidance increased his career high from the free throw line from 60% to 69%. When it comes to shooting the basketball well, consistently, my philosophy emphasizes simplicity. The methodology educates players how each part of the body affects the shooting process, and attempts to instill a simple shooting technique that can be easily repeated. Shooting a basketball is fundamentally about muscle memory, and therefore our teachings are focused on retraining the muscles and building good shooting habits.